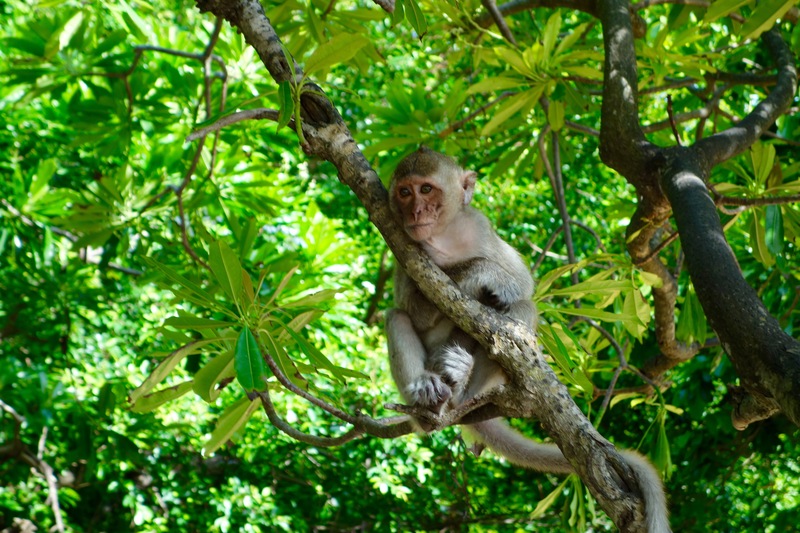 Monkey Island is a remote and tiny island near Cat Ba National Park, which is home to 32 types of mammal and over 70 bird species. 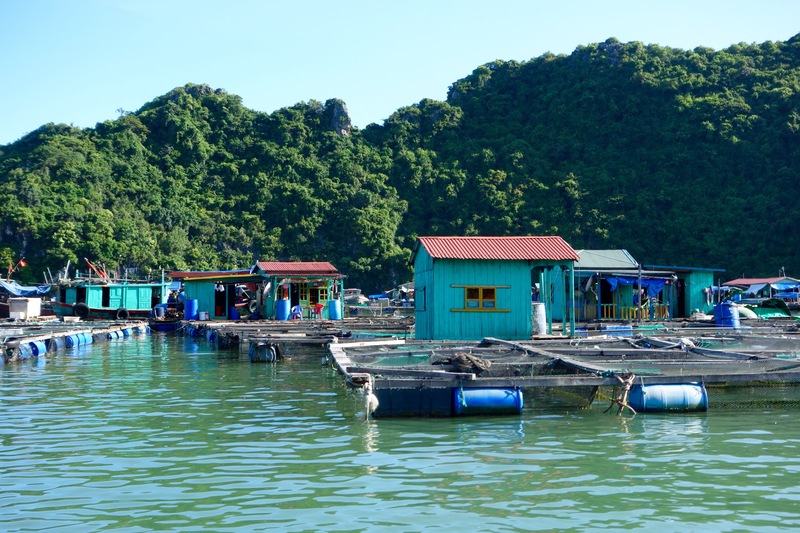 If you are looking to go somewhere wild and remote, where a fisherman’s life goes on largely untouched by tourism, then this could be the place for you. It is not much more than a strip of sand and smooth pebble beach in a rocky cove, overlooked by a jagged and lush, green mountainside. 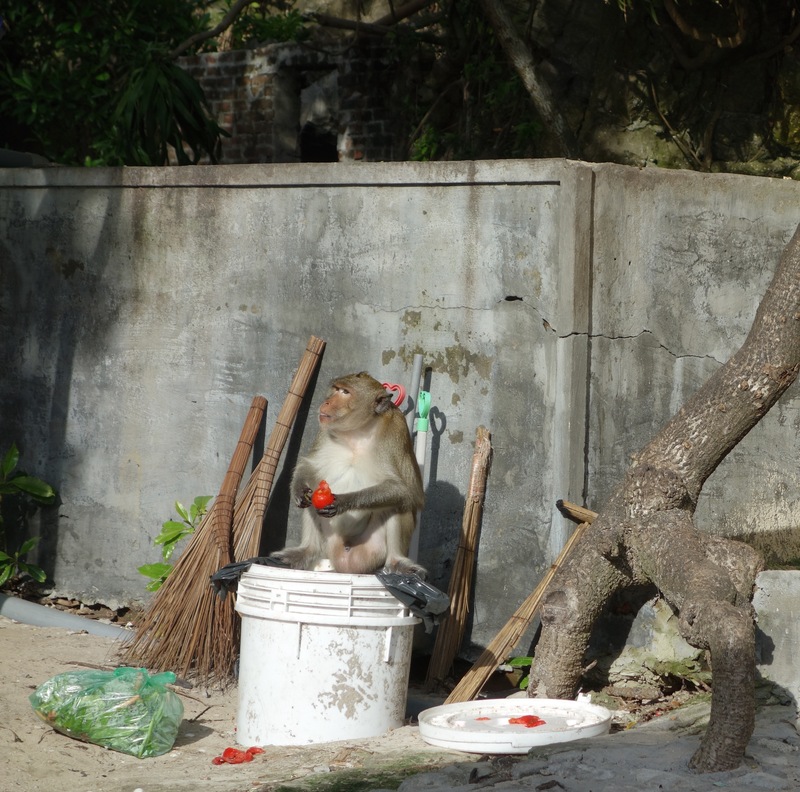 Lots of lively macaques live here, who love to scavenge and steal all they can. We also saw goats playing and skipping down the steep rock faces like, well, like mountain goats. Not for the faint hearted, the sea is ferocious, and the waves clap like thunder as they hit the beach. 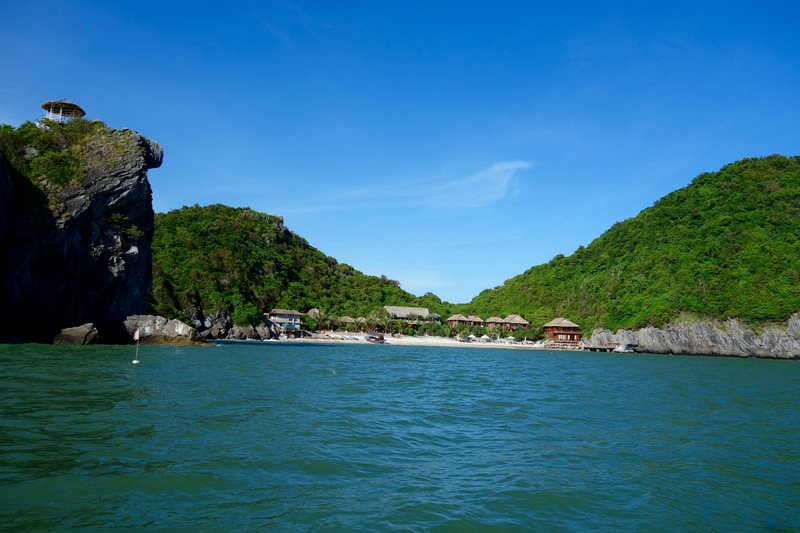 The boat to the Monkey Island takes about 20 minutes from Cat Ba Town. 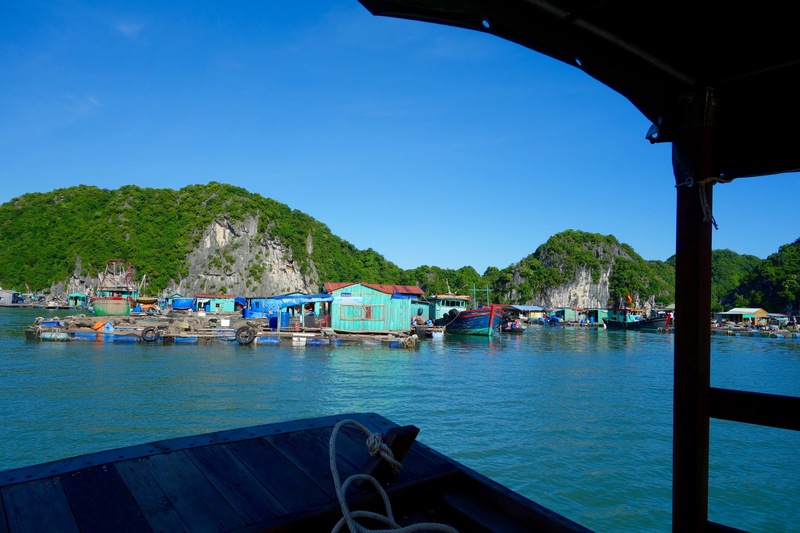 And here, unlike Halong where the communities are disappearing, we sailed past working villages of floating houses, and a ramshackle collection of pretty, brightly coloured fishing boats. 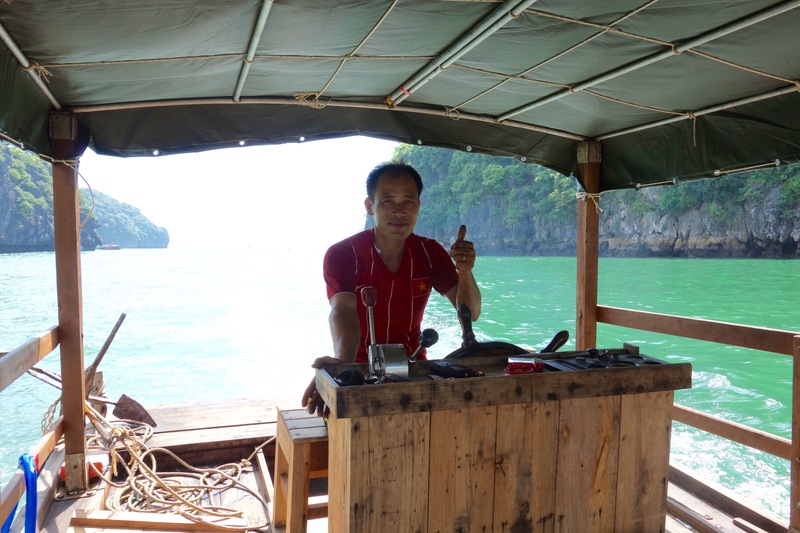 Our skipper stopped by one of the houses to pick up a fish for his tea, and there was definitely a lovely sense of being in a place where tourism and traditional life live happily together. 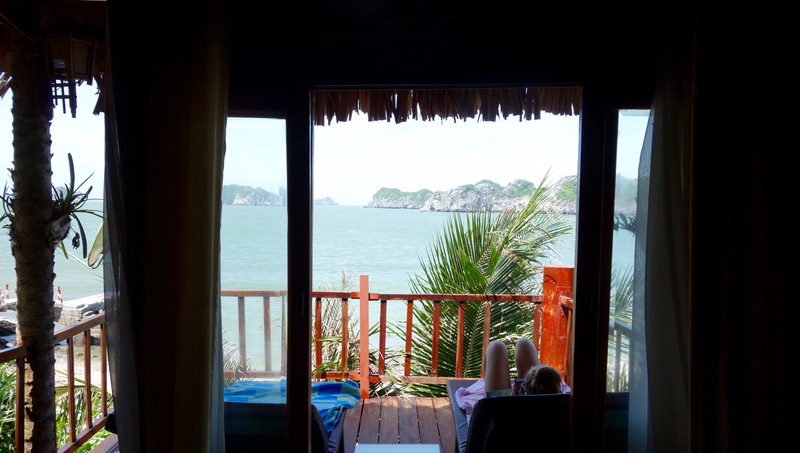 We booked 3 nights on Monkey Island Resort, which is the only place to stay on the island. 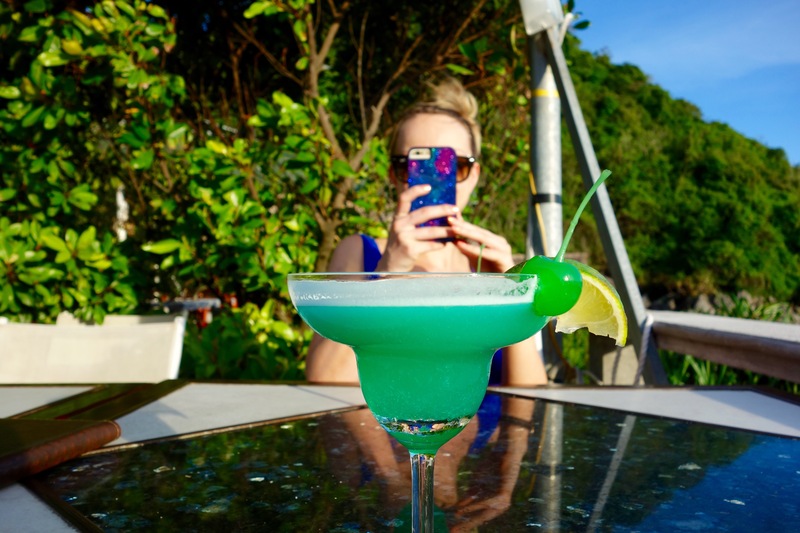 A collection of wooden bungalows and beach huts with a restaurant overlooking the sea, and a bar with a pool table and ping pong. This was by far and away the most expensive leg of our trip, but well justified when you appreciate that literally everything has to be ferried in from the mainland. We booked a deluxe sea view bungalow, but were upgraded to suite sea view room with a balcony (bonus). 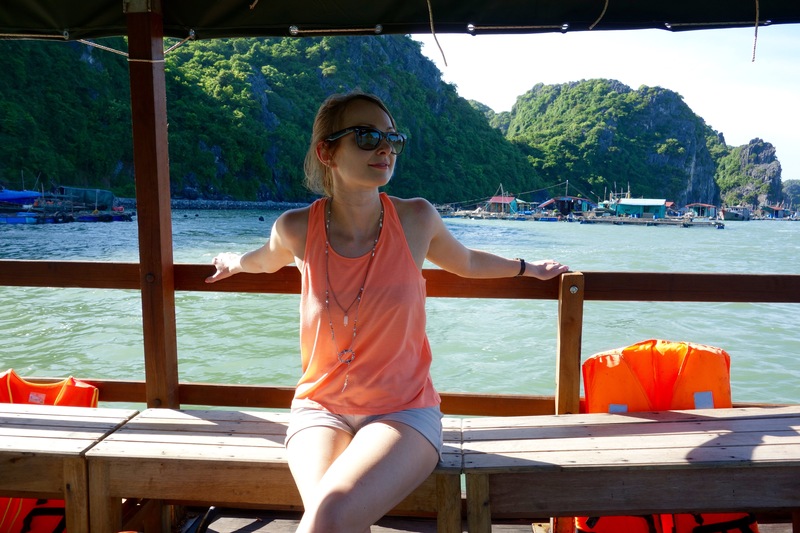 As was the theme of the whole trip, the staff cannot do enough for you and have an endearing curiosity to learn all about you, and a genuine gratefulness that you should want to visit their isolated spot. Even the deluxe suites are dark and basic, hot and sticky, with fairly feeble air con that only works from 9pm – 7am. But, this is not a place you come to looking for creature comforts. At this point I’d of course love to paint a picture of myself as an easy breezy backpacker, unphased by the back to basics place in which I found myself, but this would unfortunately not be true. It took a couple of hours to adjust, but it’s hard not to get into the swing of it when your surroundings are so beautiful. 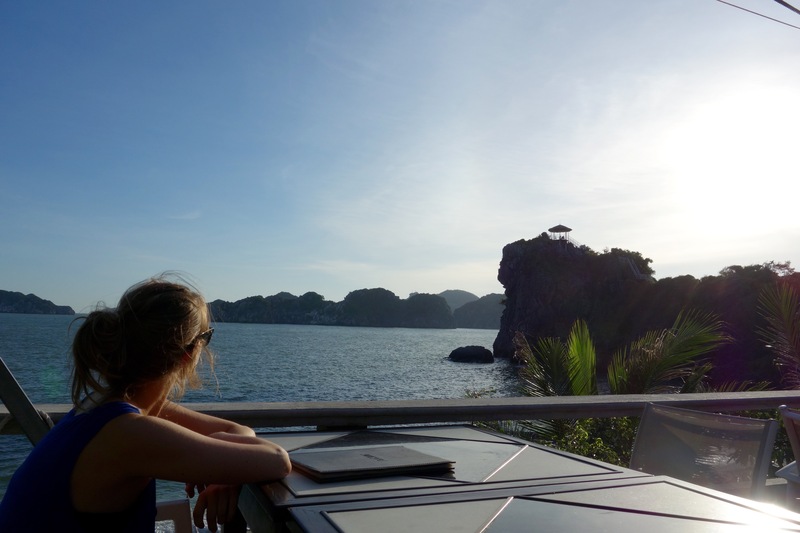 There isn’t much to do on Monkey Island, except sit and read, and take in the beautiful surroundings. 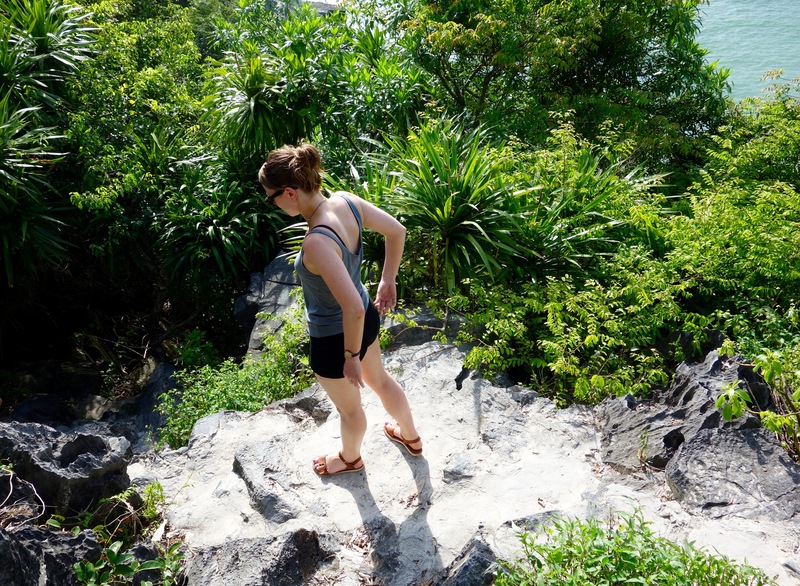 We also trekked up the hillside and across the island to visit the macaques. They are a bunch of bold opportunists ready to steal your food and hiss in disgust when they take your Pringles box, only to find its contents already eaten. A world away from the macaques we met on the Kinabatangan River in Borneo, but a product of course of their surroundings. The trek is free with a local guide, takes about 2 hours, and is well worth doing. Don’t be an idiot, do wear trainers to trek a jagged rock face! This guy plots his next move whilst enjoying some well earned chill time with his tomato. Getting off the island was an adventure in itself. We’d already heard tales of people getting marooned here because of storms only a week before, so I was relieved to open the curtains on our last morning and find the sky clear and the sea choppy, but much the same as when we arrived. We had a flight to make in Hanoi at 5pm, and so we’d been told we needed to make the ferry that sailed from Cat Ba town at 10am. 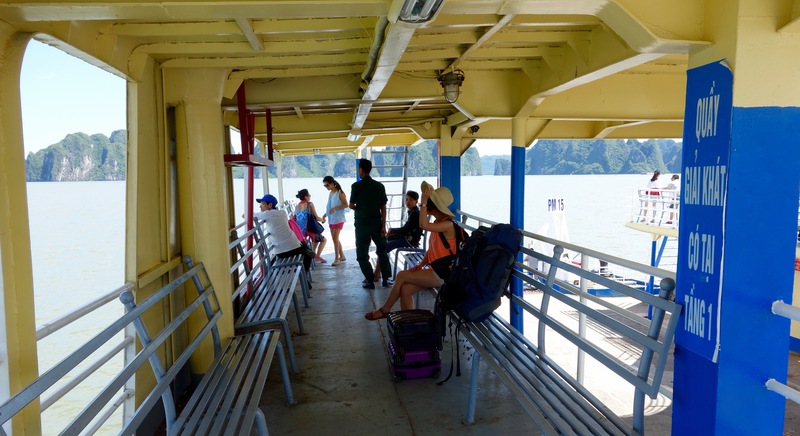 However, there were to be a lot of obstacles to navigate before safely arriving on the mainland. The little home brew boat broke down as it got to the jetty at 9am, and we watched as the skippers jumped in the sea, hammering around and trying to get the propeller going whilst the boat crashed around in the cove. 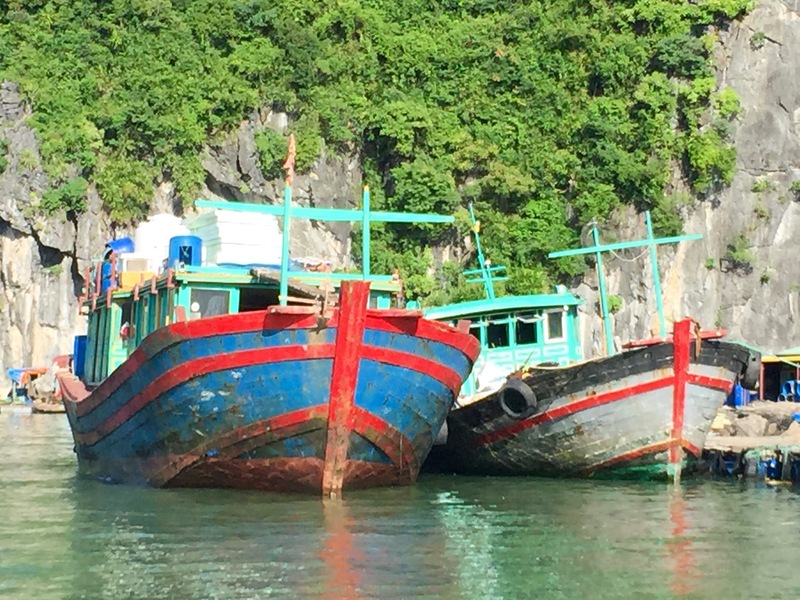 It was to be to no avail, it seems, so a speedboat arrived to tow it out of the way, and a smaller, lower roofed and even more rickety boat arrived to take us (and about 15 other tourists with rucksacks) to a big boat that would take us to Cat Ba. There was a point, as we all clambered in and the boat lurched so heavily, that the mild peril of possibly missing our ferry turned to abject terror. We didn’t have time to wait for the big boat, so, reflective of the warm and helpful nature of the people, they had managed to find someone to collect us from the big boat. So we climbed up the side of said big boat, and off the other side, lots of impractical luggage in tow (note: do not be an idiot like me and take a suitcase to Monkey Island), where another fishing style boat was waiting to take us to the mainland. Two of the skippers friends, that he had clearly rallied en route, were waiting on motorbikes at the harbour to take us to the ferry. Which, of course, had been cancelled because of the waves! So, a bus, a speedboat and a taxi later, somehow we made the 5pm flight from Hanoi and we were on our way to beautiful An Bang beach and the lanterns of Hoi An. Wowsers, now that was an adventure.